The Hornisse was a German tank destroyer of World War II. It was developed as an interim solution in 1942 and was armed with a 8.8 cm anti-tank gun. Though only lightly armoured and with a high profile, it stayed in service until the end of the war and proved to be quite successful as a tank destroyer. After the first German experiences with the newer Soviet tanks like the T-34 or the Kliment Voroshilov tank during Operation Barbarossa, the need for a Panzerjager capable of destroying these heavily armoured tanks became clear. In February of 1942, the Alkett arms firm designed a tank destroyer using their recently developed Geschutzwagen III/IV which as its name indicated used components of both the Panzer III and Panzer IV tank. On it was mounted the 8.8 cm PanzerabwehrKanone (PaK) 43 L/71, a long anti-tank development of the famous 88 mm anti-air gun. To accommodate this long and heavy gun, the hull had to be lengthened and the engine moved to the centre from the rear. Even then, weight considerations limited the amount of armour which could be used for the fighting compartment, leaving the crew almost unprotected, especially since it was also open-topped. This model was presented for approval to Adolf Hitler in October 1942 and entered production in early 1943. Its official designation was 8.8cm PaK43 (L/71) auf Geschutzwagen III/IV (Sd. Kfz. 164), though it was also known as the Panzerjager Hornisse. In late 1943 or early 1944, a new model of the Hornisse was introduced into production, which was armed with a newer gun: the 8.8cm PaK43/1 (L/71). This model also altered the driver's front armour plate. The difference between this model and its predecessor were small enough that they were almost impossible to distinguish from each other, unless you were looking at the gun. It was this model that was renamed Nashorn. 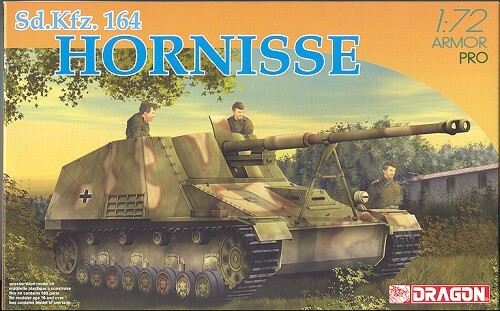 Total production of the Hornisse and Nashorn amounted to some 494 vehicles, of which most were built in 1943. As a panzerjager, it was soon replaced by the newer German tank destroyers, the Jagdpanzers, like the Jagdpanzer IV and the Jagdpanther. However, production continued, though at a low pace, into 1945. Recently, I've become interested in small scale armor. Not that aircraft have become boring, just that I'm expanding my interests a bit. Much of this is due to the number of armor books that I have reviewed as anything. Recent construction projects in this area have turned out well and so it seems that, at least for a while, I'll be doing more of these. I have been staying away from Dragon kits after Dragon USA backed out of a promise to send in review materials in exchange for my posting their weekly updates (which I did for over a year). Yeah, perhaps it is sour grapes, but these things do happen. Some mild cajoling on how great these new series of 1/72 armor kits are by the proprietor of the local hobby shop convinced me to give one a try, so here is a look at what is inside the cardboard. For one thing, there are a zillion bits and pieces, all of them very nicely molded and free of flash, sink areas and major ejector pin glitches. With the exception of the road wheels and suspension sprues, each sprue is individually packaged. In a small zip bag are individual inserts for the outer surface of the road wheels. There is also an etched brass fret and vinyl tracks. The etched fret contains the engine intake grille and covers for the ammo boxes. One can use the plastic bits for the intake grille and leave the ammo boxes open if one isn't comfortable using etched brass parts. A lot of the parts are for the 88mm cannon that makes up the main armament. When done, this gun can move in both azimuth and elevation. There is a barrel traveling brace that can be built in the up or down position. Of course, if you fix the barrel in the traveling position, you can't move it. Instructions have a lot of color in them and are well printed. Paint references are in Gunze and Model Master with generic names also provided. The color paint guides are for six different vehicles. Most are in Panzer Yellow with various camo patterns in green, brown or both. One is mostly green, making for something a bit unusual. The decal sheet seems a bit generic, providing mostly insignia and vehicle numbers. Overall, this looks to be a really excellent kit. It has a lot of small parts, and I'm sure that painting all those road wheels will be a bit tedious, but those who are really into small scale armor can add another interesting vehicle to their collection. Thanks to the Internet for the historical section.